In traditional the spiral fin tubes are using high frequency welding, resistance welding and other technology to make the stainless steel fin attached on the steel pipe. These kinds of welded spiral fin tube, the welding process has its shortcomings that cannot be overcome. While The laser welding spiral finned tube has full automatic welding process,save the manpower cost; secondly, laser welding fin solid and strong, high tensile strength test were qualified; laser welding more efficiency advantages etc. The laser welding machine is the most advanced laser welding equipment for spiral finned tube . Laser welded spiral finned tube is using a laser welding machine processing. Because the welding process is fully automatic and mechanical, the scientific and technological content and quality of laser welded spiral finned tube are better than the traditional cooling pipe. Laser welding is a high intensity laser beam to the metal surface, through the interaction of laser and metal, metal absorption laser into heat to make the metal melt after the formation of cooling crystallization welding. 1, a high degree of automation, automatic fins laser welding machine can realize one-time completion of welding, synchronous winding make the fin foot and the pipe depth of weld. 2 laser welding, high firmness, high binding force. Laser welding is metallurgical bonding, welding strength is more than 600MPa. 3, laser welding machine with high accuracy, welding a 8 meter long fin tube with a precision of 0.05mm. 4. The heat transfer coefficient can be improved greatly by laser welding. 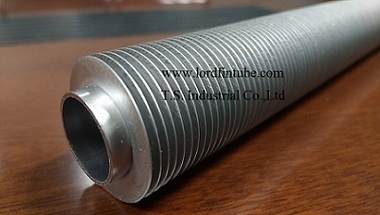 5, laser welding finned segment length is less than or equal to 2.5 mm, heat dissipation area than the high frequency welded pipe (distance is more than or equal to 4.5 mm) increased by nearly 50%, greatly reducing the material of the tube, also can decrease the change of the volume of the heat exchanger.